A moment’s thought during this hot weather will convince you of the advisability of owning your own home somewhere other than in the hot city. Yet you do not want to go away from the comforts of the city. That’s why Cheverly should appeal to you so strongly. Look into it. 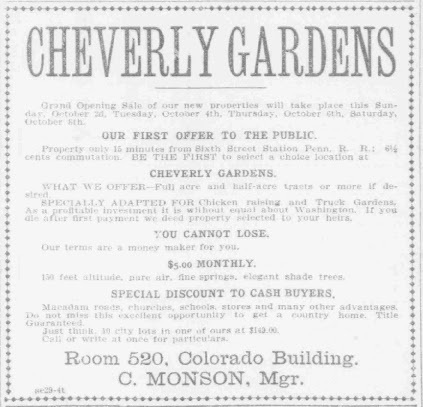 Cheverly makes a distinctive appeal in the thousands of employees of the Union Station Terminal and the Government Printing Office. Construction cost will be very low. We will assist you in financing the building of YOUR OWN HOME. Cheverly’s growth is assured. Your investment is guaranteed by the land value refunding company of 15 William Street, New York. You cannot lose! Did you know that there is a Cheverly History Club? Check it out for more fun Cheverly facts. You will love our town even more. I love the sentence in the ad that says, “Yet you do not want to go away from the comforts of the city.” Still rings true to me today.